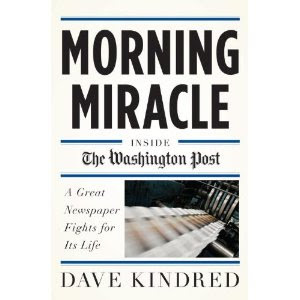 Here’s a fascinating backstage look at how a major newspaper has been battling to survive in the digital age – “Morning Miracle: Inside the Washington Post” by Dave Kindred. It documents several pivotal moments over the past 15 years, as a lumbering daily tried to understand and keep up with new media that moved at the speed of light. That decision cost the Post some of its top talent and set it back years in digital competition. Circulation and advertising continued to decline; in 2007, for the first time in two generations, the Post lost money. Graham came to realize that survival depended less on Ben Brantley-type journalism than on “mastery of the Internet.” That’s when he named Katharine Weymouth – a family member, a lawyer, not a journalist, a fun-loving mother of three – to take the reins as publisher. She made some major changes at the top, as well as a few major mistakes, but is correcting Graham’s single-minded focus and moving the Post into a two-part strategy: Washington news for local readers, and national news – digitally – for everyone else. To me, the book is a real cliff-hanger. Who knows how the Post will escape from the threat of the worldwide web? And to me, the book makes clear the fundamental irony of the Post’s continuing survival. In 1984 the Post paid a paltry sum for an educational testing service, called Kaplan. Katharine Graham was opposed to it, and no one can quite remember why it was purchased – it was not even mentioned in the annual report for that year. But in the past few years Kaplan has contributed over 50 percent of the company’s revenue, compared to 20 percent for the newspaper. Donald Graham even told Wall Street in 2008 that the Post is “an education and media company.” So the prominence of the Post today isn’t due to smart strategy and leadership; it’s mainly dumb luck. Pass some my way.